If you’ve found your way to this blog and this recipe, odds are you’re not really a lover of banana chips. You’re probably in the same boat as me. It’s January, time to start the “eat down” on the pantry and deep freeze, and to your dismay you find a huge bag of banana chips. You have no idea why you bought them in the first place. Maybe it was a sale, maybe you had grand plans for homemade trail mix, maybe you just lost your mind. Regardless, you’re stuck with them and they’re pretty horrible. They don’t really taste enough like banana to qualify as banana, but have enough banana taste that they don’t qualify as chips. They’re more like what happens when you pack a lunch with an over-ripe banana next to the kettle-cooked potato chips, and then try to eat the chewy chips a few days later. But somehow, you can’t admit defeat and just throw the bag away. It’s ok. This is a safe place. I’m here to help. After a lot of recipe searching, I finally found a solution for my 2 pounds of banana chips. (Seriously, what was I thinking?) And like most solutions, it involves chocolate. This recipe is a dairy and egg-free adaptation from Kristin’s creation over at A Pastry Affair, a fellow scientist-baker, and they turned out pretty doggone good. The banana chips are ground into a course flour of sorts. 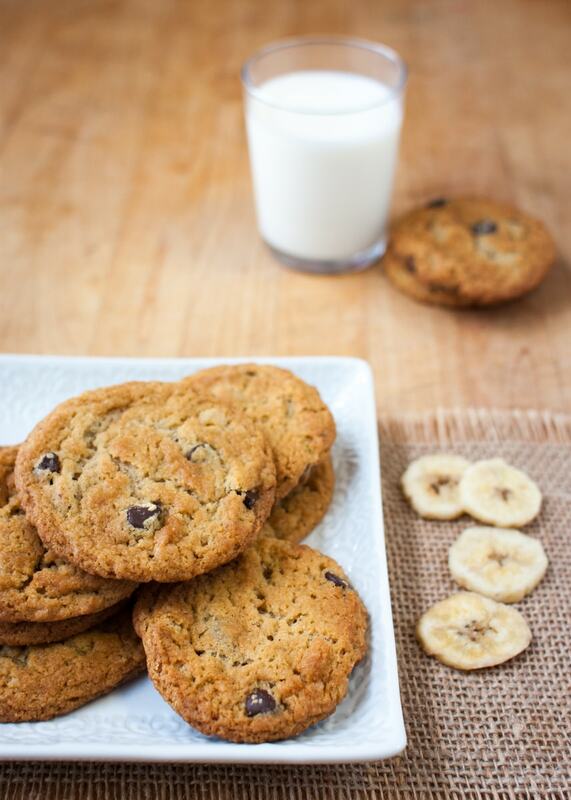 The end result is a crisp cookie with a gentle banana flavor, without the mushiness of adding actual fresh bananas. 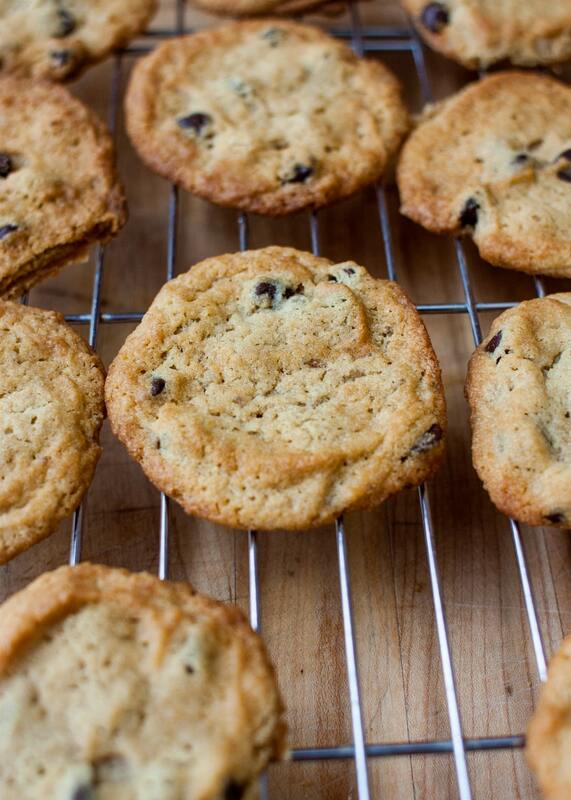 Not that I have plans to consciously buy more banana chips just to make these cookies. But if it happens again, and I find myself staring incredulously at a new bag of banana chips hiding in the bottom of the deep freeze, I have a plan. In a food processor, grind down the banana chips into a course flour. Add the flour, soda, powder and salt and pulse it all together. In a mixing bowl, cream the shortening with the sugars. Add the dairy-free milk and vanilla and beat until fluffy again. Carefully blend in the flour-banana chip mixture. Drop in spoonfuls onto a parchment lined baking sheet. Bake at 350 for 12-15 minutes or until golden. I don’t even know what to say about this picture, except that it’s true. 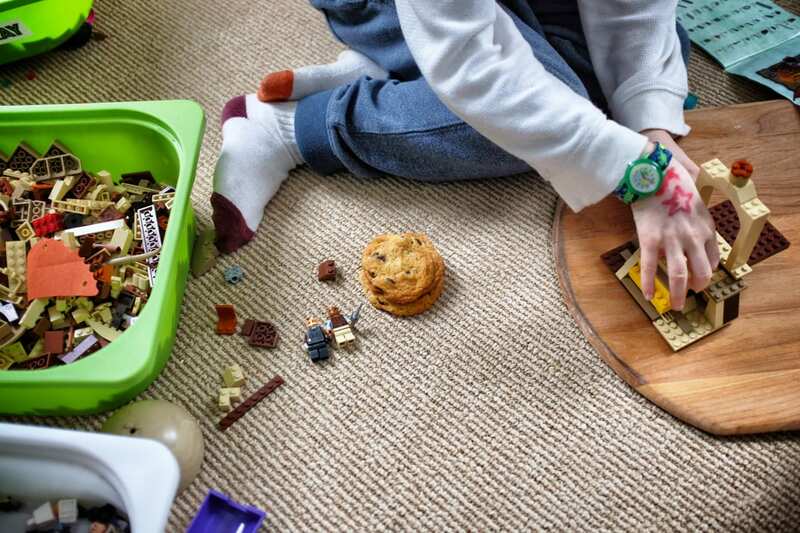 I have no idea why his socks don’t match, or what is drawn on his hand, or why my pizza peel is being used as a stand to build Legos, or what he’s even building. But it’s being fueled by cookies. I’m not sure which is more awesome–the recipe or the caption on the last photo. Thanks for another addition to my baking arsenal!! “Eat down on the pantry and deep freeze”–yes. That is exactly what we’re doing, and why I’m finding myself staring blankly at 10! bags of squash puree. One can make only so many muffins and soups. I am cracking up right now. I ordered some banana chips about an hour ago on Gerbs and then I sat here thinking about what will I do when they arrive. Well, I know now! These sound great! What a great way to save food from being wasted. Hope you start blogging more again soon! It will be helpful to know how many chocolate and banana chips cookies will it make.